iPhone OS 3 was announced on March 17, 2009, with a beta version available for developers the same day. iPhone OS 3 was officially released on June 17, 2009.
iPhone OS 3 introduced a "cut, copy, or paste" bubble dialog when users double-tap text. The "paste" button would incorporate anything stored in the device's clipboard into the marked area. Spotlight is a system-wide indexing and search feature, aiming to help users search their device for specific contacts, email messages, calendar appointments, multimedia files, apps and more. It is accessed by swiping to the right from the home screen. 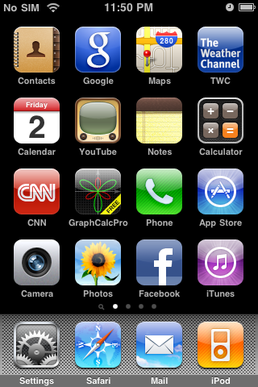 iPhone OS 3 expands the maximum number of pages on the home screen to 11, for a total number of 180 apps. The Messages app received native support for the Multimedia Messaging Service (MMS), allowing users to send and receive messages that also contain pictures, contacts, locations, voice recordings, and video messages. The Camera app introduced video recording for iPhone 3GS. The Photos app featured a new copy button and the ability to delete multiple photos at once. iPhone OS 3 added a "Voice Memos" app, allowing users to record their voice. Upgrading to iPhone OS 3 was free for iPhone. Upgrading to iPhone OS 3 cost iPod Touch users $5 to $10, depending on device purchase date. iPhone OS 3 was the last iOS to charge iPod Touch users to upgrade. Starting with iOS 4, iOS upgrades became free for all users, including users of iPod Touch. ^ Patel, Nilay (June 7, 2010). "iPhone OS 4 renamed iOS 4, launching June 21 with 1500 new features". Engadget. AOL. Retrieved July 20, 2017. ^ Topolsky, Joshua (March 17, 2009). "Live from Apple's iPhone OS 3.0 preview event". Engadget. AOL. Retrieved July 20, 2017. ^ Slivka, Eric (June 17, 2009). "Apple Releases iPhone OS 3.0 for iPhone and iPod Touch". MacRumors. Retrieved July 20, 2017. ^ Cohen, Peter (June 8, 2009). "iPhone OS 3.0 Coming on June 17". PC World. International Data Group. Retrieved July 20, 2017. ^ a b Cohen, Peter (March 17, 2009). "Cut and paste, MMS highlight iPhone 3.0 improvements". Macworld. International Data Group. Retrieved July 20, 2017. ^ Patel, Nilay (March 17, 2009). "iPhone finally gets copy and paste!". Engadget. AOL. Retrieved July 20, 2017. ^ "Photos: Apple iPhone OS 3.0, copy and paste included". CNET. CBS Interactive. March 17, 2009. Retrieved July 20, 2017. ^ Frakes, Dan (June 17, 2009). "Hands on With IPhone 3.0's Spotlight". PC World. International Data Group. Retrieved July 20, 2017. ^ a b c d Ritchie, Rene (June 17, 2009). "iPhone OS 3.0 review". iMore. Retrieved July 20, 2017. ^ Moren, Dan (June 17, 2009). "iPhone 3.0 software update". Macworld. International Data Group. Retrieved July 20, 2017. ^ "iOS: A visual history". The Verge. Vox Media. September 16, 2013. Retrieved July 20, 2017.